Austrian artist juxtaposes fairytale characters with aquatic landscapes. Divers were required to set up surreal underwater art galleries in the Maldives, viewable only from venues that are located beneath the ocean’s surface. 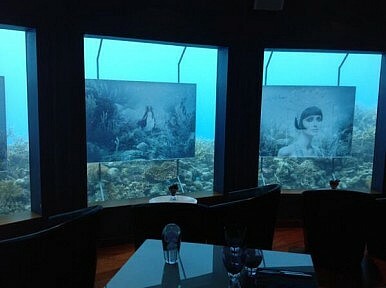 Viennese photographer Andreas Franke’s submerged show, titled Phantasy Fairytale, is currently underway at two of the island nation’s most exclusive resorts: Huvafen Fushi, the honeymoon destination for Tom Cruise and Katie Holmes, and NIYAMA. Divers positioned the works outside the windows of Huvafen Fushi’s LIME Spa and NIYAMA’s Subsix music club. The artist, also an avid diver, sealed each work in stainless steel and Plexiglas frames. Pieces on display at Huvafen Fushi measure 110 cm by 73.5 cm and are offered for sale at $12,000 each. The 150 cm by 110 cm pieces being shown at NIYAMA will cost potential buyers $15,000 each. Phantasy Fairytale isn’t Franke’s first undersea art exhibit; but it is the first that doesn’t require scuba gear. In 2011, he turned the Vandenberg shipwreck off Key West, Florida into a dive-up gallery. He combined photographs of the decaying former military vessel with scenes of ordinary life. In one image, a girl runs along the deck chasing tiny fish with a butterfly net. The first-of-its-kind display, located at a depth of 93 feet, was titled Vandenberg: Life Below the Surface. Unlike the Vandenberg exhibit, however, visitors are barred from diving near the works. Each resort is offering special four-night packages for travelers hoping to catch a glimpse of the sunken art – ranging from approximately $900 to $1200 per night. Fake News in India and Indonesia's Elections 2019East Asian Footballers Make Their Way WestThe Indian Heart: The Polish Singer Who Mastered Hindustani MusicThe World's Third Pole Is MeltingIs Boxing's Tokyo 2020 Olympic Future on the Ropes?